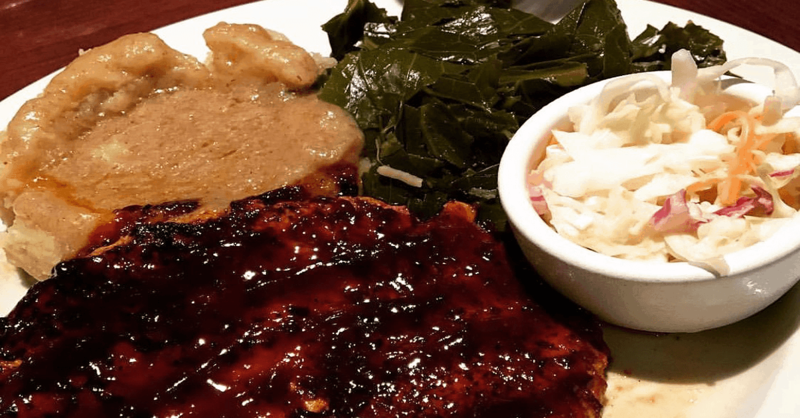 It’s time for some vegan BBQ chicken, mashed potatoes, and collard greens. This bbq chicken recipe sticks to the traditional flavors, seasoning and texture as much as possible. And then end result is something to get excited about. If you are a vegan craving some BBQ chicken then you will be happy with this recipe. The garlic mashed potato are light and fluffy and full of flavor. The collard greens are authentically southern and amazing as well. Mix all the ingredients in a small saucepan. Bring to a boil and then reduce the heat and let it simmer for 20 minutes until thickened. Keep warm until needed. Mix the herbs and spices in a bowl. Rub the spice mix over the chicken strips. Cook the chicken strips until browned on both sides, about 3 minutes per side. Place potatoes in a large saucepan or pot and cover with water. Bring to a light boil over medium-high heat, add 1 tsp of salt, cover and cook for 25-30 minutes or until very tender. While the potatoes are cooking, chop up your chives and measure your butter. Drain your potatoes and transfer to a large mixing bowl. Mash your potatoes until fluffy. Add in butter, garlic, salt, black pepper and stir to combine. Simmer for 1 hr to 1 hr 30 mins. Do not boil. Add more vegetable broth if needed. May need more or less time so be sure to check them after 30-45 minutes. When done, greens will be dark green, tender and will not have a raw taste.